Not to be confused with Fondant icing. Fondue (UK: /ˈfɒnd(j)uː/, US: /fɒnˈd(j)uː/, French: [fɔ̃dy]) is a Swiss melted cheese served in a communal pot (caquelon or fondue pot) over a portable stove (réchaud) heated with a candle or spirit lamp, and eaten by dipping bread into the cheese using long-stemmed forks. It was promoted as a Swiss national dish by the Swiss Cheese Union (Schweizerische Käseunion) in the 1930s, and was popularized in North America in the 1960s. Since the 1950s, the term "fondue" has been generalized to other dishes in which a food is dipped into a communal pot of liquid kept hot in a fondue pot: chocolate fondue, in which pieces of fruit or pastry are dipped into a melted chocolate mixture, and fondue bourguignonne, in which pieces of meat are cooked in hot oil or broth. The word fondue is the feminine passive past participle of the French verb fondre ("to melt") used as a noun. It is first attested in French in 1735, in Vincent la Chapelle's Cuisinier moderne, and in English in 1878. The earliest known recipe for cheese fondue comes from a 1699 book published in Zurich, under the name "Käss mit Wein zu kochen", "to cook cheese with wine". It calls for grated or cut-up cheese to be melted with wine, and for bread to be dipped in it. However, the name "cheese fondue", until the late nineteenth century, referred to a dish composed of eggs and cheese, as in la Chapelle's 1735 Fonduë de Fromage, aux Truffes Fraiches it was something between scrambled eggs with cheese and a cheese soufflé. Brillat-Savarin wrote in 1834 that it is "nothing other than scrambled eggs with cheese". Variations included cream ("à la genevoise") and truffles ("à la piémontaise") in addition to eggs, as well as what is now called "raclette" ("fondue valaisanne"). The first known recipe for the modern cheese fondue under that name, with cheese and wine but no eggs, was published in 1875, and was already presented as a Swiss national dish. Despite its modern associations with rustic mountain life, it was a town-dweller's dish from the lowlands of western, French-speaking, Switzerland: rich cheese like Gruyère was a valuable export item which peasants could not afford to eat. Fondue was popularized as a Swiss national dish by the Swiss Cheese Union (Schweizerische Käseunion) in the 1930s as a way of increasing cheese consumption. The Swiss Cheese Union also created pseudo-regional recipes as part of the "spiritual defence of Switzerland". After World War II rationing ended, the Swiss Cheese Union continued its marketing campaign, sending fondue sets to military regiments and event organizers across Switzerland. Fondue is now a symbol of Swiss unity. In the meantime, fondue continued to be promoted aggressively in Switzerland, with slogans like "La fondue crée la bonne humeur" 'fondue creates a good mood' and (1981, in Swiss German) "Fondue isch guet und git e gueti Luune" 'fondue is good and creates a good mood' – abbreviated as "figugegl". Fondue was promoted to Americans at the Swiss Pavilion's Alpine restaurant at the 1964 New York World's Fair. The extension of the name "fondue" to other dishes served in a communal hot pot dates to 1950s New York. Konrad Egli, a Swiss restaurateur, introduced fondue bourguignonne at his Chalet Suisse restaurant in 1956. In the mid 1960s, he invented chocolate fondue as part of a promotion for Toblerone chocolate. A sort of chocolate mousse or chocolate cake had also sometimes been called "chocolate fondue" starting in the 1930s. A full cheese fondue set in Switzerland. Apart from pieces of bread to dip into the melted cheese, there are side servings of kirsch, raw garlic, pickled gherkins, onions, and olives. Cheese fondue consists of a blend of cheeses, wine and seasoning. To prepare the caquelon it is first rubbed with a cut garlic clove. White wine is slightly heated with cornstarch, and then grated cheese is added and stirred until melted. It is often topped off with a bit of kirsch. The cornstarch or other starch is added to prevent separation. The mixture is stirred continuously as it heats in the caquelon. When it is ready, diners dip cubes of bread speared on a fondue fork into the mixture. Fribourgeoise: Vacherin fribourgeois à fondue,[Note 1] wherein potatoes are often dipped instead of bread. This is the only cheese fondue that does not use wine. The cheese is melted in a few tablespoons of water over low heat. Moitié-moitié (or half and half), also called Fondue Suisse: Gruyère and Fribourg vacherin. Innerschweiz: Gruyère, Emmental, and Sbrinz. Genevoise: Gruyère (preferably of several stages of maturity) with a little Emmentaler and Valais cheese. Sometimes chopped sautéed morels are added. Appenzeller: Appenzeller cheese with cream added. Tomato: Gruyère, Emmental, crushed tomatoes, and wine. Spicy: Gruyère, red and green peppers, with chili. Mushroom: Gruyère, Fribourg vacherin, and mushrooms. Savoyarde: Comté, Beaufort and one or two other local cheese like Reblochon, Abondance, or French equivalent of Gruyère. Jurassienne: Mature or mild Comté. Refrigerated fondue blends are sold in most Swiss supermarkets as convenience food and need little more than melting in the caquelon. Individual portions heatable in a microwave oven are also sold. Fondue chinoise (lit. "Chinese fondue") is a common name for hot pot, where meat and vegetables are cooked in a shared pot of broth, or just dip the sliced meat with fondue fork into boiling broth with salad as side dish. Various sauces are provided on the side. After all the diners have finished cooking, they eat the now well-flavored broth. Slices of fruit or pastry are dipped in a caquelon of melted chocolate, often flavored with rum or kirschwasser. Dessert fondues may also be made with coconut, honey, caramel, or marshmallow. Fondue bourguignonne consists of a fondue pot filled with hot oil into which diners dip pieces of meat to cook them. Various dipping sauces are provided on the side. "Fondue vigneronne" or "Fondue Bacchus" is like fondue bourguignonne, with wine rather than oil. Red wine fondue consists of red wine boiled, and seasoned with salt, pepper, garlic, onions and herbs; the white wine version is spiced with cinnamon, chilis, coriander, white pepper and enriched with chicken broth. The guests then dip meat, fish or vegetables in the caquelon and top them with bearnaise, tartare sauce or simply French mustard. Consists of a metallic or stone slab. Primarily for meat fondue, oil or olive oil is poured on the slab, and the meat is cooked over it like in a pan. It is a very common form of fondue in South America. A tradition says that if a man loses his bread in the pot, he buys drinks all around. Fondue is eaten by spearing a piece of bread on a fork, swirling it in the pot, and putting it into the mouth. Some writers recommend that the dipping fork be used only to transport the food from the pot to one's plate, not to eat from. The choice of beverage to drink with fondue is specified in several conflicting traditions; some demand that white wine should be drunk, while others specify black tea as the beverage of choice. Some people drink a shot of spirits during or after the meal. A study published in 2010 showed that none of these beverages caused indigestion after eating fondue. Bagna càuda, a similar olive oil-based Northern Italian dish. Vacherin fribourgeois exists in two forms, vacherin à fondue, used for making fondue and vacherin à main, a dessert cheese. ^ "fondue". Oxford Dictionaries. Oxford University Press. Retrieved 16 January 2015. ^ "fondue". The American Heritage Dictionary of the English Language (5th ed.). Boston: Houghton Mifflin Harcourt. 2014. Retrieved 10 April 2017. ^ Oxford English Dictionary, Second edition, 1989; online version November 2010. s.v. ^ Barry Popik, The Big Apple blog, "Chocolate Fondue (myth)"
^ See 1 and 2. ^ "Fleischfondue richtig genießen : so isst man richtig das Fleischfondue". Blick.ch. ^ Henriette Heinrich; Oliver Goetze; Dieter Menne; Peter X Iten; Heiko Fruehauf; Stephan R Vavricka; Werner Schwizer; Michael Fried; Mark Fox (December 2010). "Effect on gastric function and symptoms of drinking wine, black tea, or schnapps with a Swiss cheese fondue: randomised controlled crossover trial". BMJ. 341. doi:10.1136/bmj.c6731. PMC 3272707. 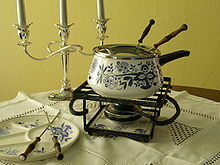 Wikimedia Commons has media related to Fondue.